Remember I blogged that I lost most of the photos I took at Stonehenge at the Summer Solstice because my camera card corrupted? Well, a wonderful friend who is brilliant at techie stuff managed to save most of them and yesterday gave me a flash drive with the rescued pics. Here is one of them - a corvid at Stonehenge. Yes. I know you can't actually see the stones in the background so you will have to take my word for it that the bird was at the ancient stone circle. And yes, it would have been a much more impressive photo if it had been perched on one of the iconic sarsens. Nevertheless I was pleased to see the bird and pleased to get the picture recovered. I originally thought the bird was a raven and blogged to that effect. Ravens are birds that appear frequently in the mythology of the British Isles. The Celtic goddess of battle, the Morrigan, can take the form of a raven, the Irish sun god Lugh was associated with ravens, in Welsh tales the name of the legendary hero Bran the Blessed means "raven" and, according to legend, the ravens at the Tower of London protect England from downfall. However, I was later informed in a comment (which you can read below, that in fact it is in fact a rook, another member of the corvid family. 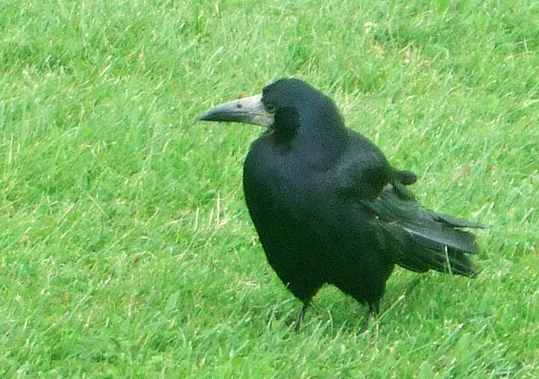 This is a rook, not a raven. Recognisable by the grey beak and scruffy feathers around the legs. Oh thank you very much for pointing that out! My mistake. I will correct it.